How to Design an Outdoor Living Space in 5 Easy Steps — KTJ Design Co.
We’ve recently designed two outdoor living rooms for our clients, and it made me want to dig out my patio furniture and decorations from storage. …So, this past weekend, I finally did it! I hauled out the table and dining chairs, chaise lounges, sofa and lounge chairs, and of course, the umbrellas. My patio now looks so lovely—and it also smells heavenly due to the jasmine being in full bloom. #1 Ditch the plastic chairs …and replace them with sofas, coffee tables, side tables and ottomans. It is easy to plop a table, four chairs and umbrella on the patio, but you need to incorporate some of the same elements as you would any other living space of your house. Thanks to plush outdoor fabrics, you can have lots of comfy seating. 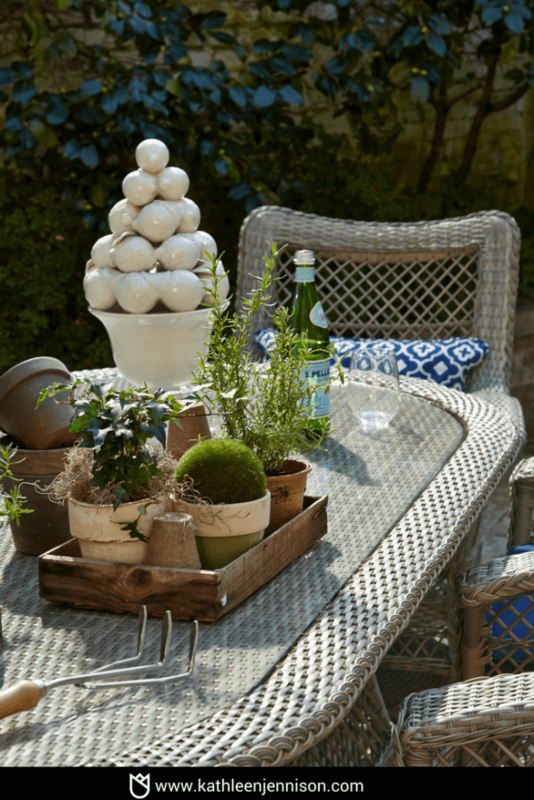 #2 Dress it up …by adding a few accessories to make your outdoor room feel inviting. Incorporate throw pillows, vases, pots, and even outdoor lamps. This is the best way to personalize your outdoor furniture and add your unique style. #3 Have fun with color …and don't be afraid to use bright colors for your outdoor room decor. It is less intimidating than interior decor and makes your backyard the chicest hangout in town. On our recent field trip to North Carolina to the High Point Market we saw lots of fabulous outdoor furniture and fabrics in bright blues and pink. Coupled with lively patterns (like palm leaves, pineapples or flamingos), you’ve got a festive theme. #4 Don’t forget the flooring …and be sure to include an area rug that grounds and defines the area. Outdoor rugs are relatively inexpensive and easy to clean (just take a garden hose to it and you are good to go). Rugs made out of polypropylene are durable and pretty (you might even be tempted to bring them indoors). #5 Add lighting for major drama …by stringing some lights under the patio cover or installing some lights along the fence. Add ambiance with candles housed in lanterns, and don’t forget that a fire pit can also be an excellent light source. Pssst: Our outdoor furniture line has several propane fire pits that are perfect for roasting marshmallows. You can incorporate these 5 outdoor room ideas right away and start planning the greatest Memorial Day party ever to show off all your outdoor room ideas. If you need any help with your patio, the designers at KTJ Design Co are full of outdoor room ideas that will knock your flip flops off, plus we offer an outdoor furniture line that is top notch. Check it out right here.